What is CTS and RSI, and why should you care? Do I have to align my wrists to the keyboard's columnar key arrangement? Why is the Truly Ergonomic keyboard flat where the center is not raised as other keyboards? Why is the Truly Ergonomic keyboard non‑adjustable? Where can I download the application to reprogram the keyboard? Where is the location of a specific key? Why some letters/symbols sent to the computer do not correspond to the printed on the keyboard? What is Full N‑key rollover (NKRO)? What is the Truly Ergonomic keyboard's Cable length? Is it compatible with USB? What are the Truly Ergonomic keyboard's Dimensions? What is the weight of the Truly Ergonomic keyboard? What is the material of the Keycaps and other parts of the keyboard? What is the painting process used for the Keycaps? Carpal Tunnel Syndrome (CTS) is a condition that can arise when pressure is placed on the nerves that pass through the narrow wrist canal, often causing irritation and severe pain. CTS is due in large part to the use of tools that are not ergonomically designed. Repetitive Strain Injuries (RSI) are serious occupational health concerns caused by the repetitive use of products that are not ergonomic. RSI can greatly diminish the potential to work properly; in some cases sufferers are unable to work at all, generally due to the repetitive daily use of non‑ergonomic products. A common misconception is that the Truly Ergonomic keyboard is only for those who already have work‑related conditions like CTS or RSI. But when you use a conventional keyboard day after day, you have a high risk of getting CTS or RSI as anyone can develop these conditions through repetitive typing and the use of conventional keyboards. Even more upsetting is that young people, who are now using computers at early ages, can easily develop CTS and RSI. Our children's generation is the first that will use a computer for their entire lives, and unfortunately, evolution is not going to catch up that quickly. Conventional keyboards, based on the staggered key arrangement of typewriters from the 1860s, cause too much pain for regular use. Even fast typers, who believe they are fully adapted to old keyboards, could greatly improve their well‑being and workplace efficiency if their keyboards were designed for comfort, like the Truly Ergonomic keyboard. Learning to type correctly by using the Truly Ergonomic keyboard is easy for everyone and helps you accelerate your productivity in a comfortable and healthy manner. Contrary to common believe, individuals with both wide and narrow shoulders can easily adjust to the Truly Ergonomic keyboard design. Users do not need their wrists fixed in a particular position, and the Truly Ergonomic keyboard design should not be perceived as 'one size fits all'; it is a well‑thought design. but without the need to match the exact split‑angle of the Truly Ergonomic keyboard. Comfort is what you are looking for and what is most important. So feel free to have your hands and forearms in the angle you feel most comfortable, disregarding matching the angle of the columnar key arrangement, as long as your wrists are as straight as possible. We do suggest as well to 'float' the hands while typing, like playing the piano; it is not recommended resting your palms on the palm–rest while typing, only rest the palms when not typing. In regard as to why we focused on a planar design is somehow technical, but it explains our motivations. Several studies have concluded that people can in fact type safely with their hands flat, using a planar computer keyboard without suffering pain or problems caused by pronation of the hands. The human body is designed to work properly and without pain with their hands flat. We realize it's possible to incur some pain when the hands are excessively pronated and exerting significant force. However, we believe that ulnar deviation is a significantly more important issue to typists, so this has warranted more attention in the design of our products. When the wrists are bent outwards in the direction of the pinkie, as happens when typing with a conventional keyboard, this is called Ulnar Deviation. Repeated use of a conventional keyboard means repeatedly stressing your hands and wrists through ulnar deviation, increasing the risk of developing Carpal Tunnel Syndrome (CTS), Repetitive Strain Injuries (RSI), and tendonitis. Anyone can develop these conditions through repetitive typing and the use of conventional keyboards that require excessive ulnar deviation from the user. The Truly Ergonomic keyboard is designed to reduce Ulnar Deviation as much as possible by splitting the keyboard with a split angle matched to embrace the symmetry and neutral position of the human body, and by arranging the keys in columns that align with the fingers of the hands rather than arranging them in staggered form in rows. Keeping the keyboard small also serves to address this issue by limiting the distance between where the mouse is placed and the center line of the keyboard. We believe that our design is properly focused on reducing ulnar deviation, while conveniently minimizing adjustment time to the layout, and while maintaining familiarity and ease of use. As well, we do recommend to type with the wrists as straight as possible, as the straighter the better, without the need to match the exact split–angle of the Truly Ergonomic keyboard; comfort is what you are looking for and what is most important. Why is the Truly Ergonomic keyboard non-adjustable? What nobody else mentions and it is a big issue, is that too much split or separation like in other ergonomic keyboards or having two separate parts as adjustable keyboards do, might work for some touch typists, but they definitely do not work for non‑touch typists. For all non‑touch‑typists, is counterproductive and becomes non‑ergonomic as you would constantly need to shift your neck and/or eyes side‑to‑side to type, and could lead to suffering from pain in the neck, headaches, and even nausea. We recognize as well that some people believe that an adjustable keyboard should be inherently better, but in truth they are not; otherwise, our Truly Ergonomic keyboard design would have been adjustable. Furthermore, all current adjustable keyboards as most other keyboards are still based on 1860s typewriter's staggered key arrangement design. Even worse, they all use rubber domes that have an uncertain and spongy feel, greatly vary their sensitivity through their short life, and require to use too much force causing pain and strains in your wrists, shoulders, neck, and lower back. Most corporations that manufacture adjustable keyboards only split a conventional keyboard in half and sell for twice as much. The Truly Ergonomic keyboard design fits and is better to the vast majority of users compared to any adjustable keyboard on the market. The reality of adjustable keyboards is that it is very difficult to find the "golden position" for each individual (the best angle, pitch/slant, front distance, width separation), and once found - if ever, it is very easy to move either of the parts to distort the positioning which could cause more pain and discomfort than even using conventional keyboards. Not to mention that the desk height and arrangement, the chair adjustments, and the mouse positioning greatly affects both keyboard parts of these adjustable keyboards. As for adjustability, rather than each user guessing the best position for them, as we have seen many people do a terrible job with their workstation setup, we prefer a Company dedicated to ergonomics, such as Truly Ergonomic, to research and analyze the best arrangement of keys for the human body. If adjustability would be perfection, each key should have to be adjustable, which would create a totally different and very expensive product, instead of just randomly ripping a conventional keyboard in two. As per the Truly Ergonomic keyboard design, contrary to common believe, individuals with both wide and narrow shoulders can easily adjust. Users do not need their wrists fixed in a particular position, and the Truly Ergonomic keyboard design should not be perceived as 'one size fits all'; it is a well‑thought design. We do recommend to type with the wrists as straight as possible, as the straighter the better, without the need to match the exact split–angle of the Truly Ergonomic keyboard; comfort is what you are looking for and what is most important. So feel free to have your hands and forearms in the angle you feel most comfortable, disregarding matching the angle of the columnar key arrangement, as long as your wrists are as straight as possible. All that said, a well‑designed ergonomic keyboard, like the Truly Ergonomic keyboard, is significantly more ergonomic and easier to use and adapt compared to just splitting a staggered layout, even if each section is isolated. As Charles Darwin revealed, 'the one that is most adaptable to change' survives; humans are very adaptable, and adapting to the Truly Ergonomic keyboard design is easy and straightforward. You have the option to simply plug in the keyboard and use it with the language of your preference without the need to install any additional software. Additionally, the Truly Ergonomic keyboard includes DIP switches to simplify changing the most common settings without the need to install any software. For those who require special functionality, all keys are reprogrammable, where you have the option to change any required keys for the letters or symbols of your preference. This includes both spacebars where each spacebar can have its own functionality. There are no restrictions of which keys accept accents or special languages. If you want to reprogram your Truly Ergonomic keyboard and/or create your own custom layout, please go to our Layout Designer. Please visit the location of a specific key within the Installation & Quick Start Guide section to review the location of specific keys such as the Windows key, Meta, command ⌘, ↵ Enter, ⌫ Backspace, CapsLock, NumLock, ScrollLock, Insert, PrintScreen, Pause/Break, Application/Menu, or Fn. We ask that you verify the language and keyboard layout selected in your computer. All Truly Ergonomic keyboards correspond to the English language and English US QWERTY layout. If your selected language/layout is different, then some of the letters and symbols sent to the computer will not correspond to the printed letters and symbols on the keyboard keys. The letters and symbols used by the computer when typing are determined jointly by the keyboard language settings in your Operating System (English, German, French, etc. ), and the Truly Ergonomic keyboard model and settings. Although the printed letters on the Truly Ergonomic keyboards might differ from yours, you can set your computer to the language/layout of your preference that includes all the required letters, symbols, and accents of this language. This means that if your current Operating System configuration is already working with a layout, by simply connecting the Truly Ergonomic keyboard into your computer will work as well as this layout, disregarding the printed letters on the keyboard keys. Additionally, some languages use the combination of two keys to produce a letter or symbol; for example, pressing the ' key followed by the a key in some languages will result in the letter "á", pressing the ' key by itself will usually send nothing, and pressing the ' key followed by the space will send the ' symbol. Most computer keyboards have printed letters and symbols on their keys to help identify which letter or symbol is sent to the computer when a key is pressed. Within all modern Operating Systems, any computer keyboard can be set to work with any language/layout (JIS, ISO, or ANSI), disregarding that the printed letters or symbols in the keyboard might not match the language selected in your Operating System. Meaning, you can have a US English layout keyboard plugged‑in into a computer with the German language selected, or you can have a JIS layout keyboard plugged‑in into a computer with the English language selected, and both will work properly, with the difference that a few keys will send different letters or symbols compared to what is printed on the keyboard keys. The Truly Ergonomic keyboard includes DIP switches to simplify changing the most common settings without the need to install any software. DIP switches are five hardware switches located on the underside of the keyboard that change keyboard settings. These allow changing key functionality between those required for different Operating Systems or able to reprogram the spacebars differently; possible, with the simple flip of a switch. Please visit the Installation & Quick Start Guide section to learn more. You can also fully reprogram your Truly Ergonomic keyboard and/or create your own custom layout via our Layout Designer. What is Full N-key rollover (NKRO)? The Truly Ergonomic keyboard incorporates Full N‑key rollover capability (6‑key rollover plus modifiers restricted by USB specifications). This allows each keystroke to be processed independently, eliminating the unresponsive keystroke issues that plague most keyboards. Only high‑end keyboards have Full N‑key rollover (NKRO) where each key is scanned individually by the keyboard hardware. Compared to most keyboards that only achieve 2‑key rollover (2‑KRO) where the third or later simultaneous keystrokes get lost and/or cause conflicts. With Full N‑key rollover, the main advantage is that each keypress is correctly detected regardless of how many other keys are being pressed or held down at the same time. Note that current USB specifications limit 6 keys plus modifiers to be typed simultaneously. Most keyboards often cannot keep up with very fast typists. The result is called ghosting - letters missing from what you actually typed or additional letters that you didn't type. Full N‑key rollover can also be identified as "Anti‑Ghosting" as it eliminates these possible problems. Full N‑key rollover allows you to type as fast as you're able. The Truly Ergonomic keyboard allows you to type as comfortable and as fast as you're able. What is the Truly Ergonomic keyboard's Cable length? The Truly Ergonomic keyboard is USB wired. The approximate USB cable length is 183 cm or 6.0 ft.
Is it compatible with USB? The Truly Ergonomic keyboard uses a USB Type-A cable. If your computer has a conventional rectangular USB Type-A port, then the Truly Ergonomic keyboard is able to plug in directly and is 100% compatible. If you have a computer with the smaller USB Type-C port, you can purchase an adapter from USB Type-A to USB Type-C.
As for PS/2 - a very old technology, using a passive USB‑PS/2 adapter, and/or a PS/2 KVM switch, does not work with a true USB device like the Truly Ergonomic keyboard. The Truly Ergonomic keyboard is only compatible with true USB KVM switches. All Truly Ergonomic keyboards integrate a high‑quality removable and cushioned palmrest. It provides required support when needed, or allows you to have an even smaller footprint if removed. The Truly Ergonomic keyboard has an approximate weight of 1.2 Kg or 2.6 lb with the included high‑quality cushioned and removable palmrest, and an approximate weight of 0.960 Kg or 2.1 lb without the palmrest. Heavy for a small footprint keyboard as it is built strong, including a metal frame where the keyswitches are mounted instead of directly to the PCB reducing stress to the PCB and prolonging the life of your keyboard. And along its large rubber feet, the keyboard does not move around your desk like so many other keyboards out there. The palmrest cushioned material consists of an inner sponge made of Polyurethane material (a foamy, rubber‑like plastic), and an outer housing made of Polypropylene material (a tough thermoplastic polymer). This is equivalent as the top cushion of some high‑quality chairs' armrests. The Truly Ergonomic keyboard cushioned palmrest has a bouncy feeling and is soft to the touch. The keyboard's body and palmrest parts except the cushioned material, and the keycaps are made of Acrylonitrile Butadiene Styrene, a thermoplastic, commonly known as ABS plastic. The body parts and palmrest parts are then painted to prevent fingerprints and to provide an ergonomic non‑glossy finish. The internal metal Keyframe that holds the Mechanical keyswitches is made of SPCC; a grade of commercial steel with commercial quality. This Keyframe makes the keyboard sturdier, more stable, and more comfortable to use. Having the keyswitches mounted to a metal plate instead of directly to the PCB greatly reduces stress to the PCB prolonging the life of your keyboard. As well, the keyswitches are well secured in place producing a more solid feel. After manufacturing the above parts, the materials cool down and cure, and in some instances produce a 'new smell' odor. When taking the product out from its packaging, it is possible that a slight odor may be perceived, but this disappears after a short time of being outside the packaging. Most conventional and other ergonomic keyboards use decals or paint that is prone to easily wear‑off and usually does in a short time. For all Truly Ergonomic keyboards that have keycaps with printed letters/symbols, the blue color symbols on the top rows and the white front‑side Numeric Keypad symbols are made using the Silkscreen printing process, all other letters and symbols are printed using the Laser Engraved with white infill printing process. Both of these processes are best and are very durable. If you use hand oils, hand sanitizer, or ointments in your hands, and depending on your skin chemistry, printed Letters and Symbols' paint could weaken and could fade away with time. This is common for all computer keyboards with painted keycaps. A widespread recommendation is to clean your hands in as much as possible before using a computer keyboard, and to avoid any hand ointments if possible. Although keycaps of the same size can be interchanged and are easily removable, it is only recommended to switch keycaps within the same row as different rows have different profile shapes. Changing keycaps between different rows is possible, but not recommended as the keyboard could become cumbersome to use. Shift and Ctrl keycaps are identical and interchangeable. Enter and Backspace keycaps are identical and interchangeable. Except the V‑shape and Space keycaps, all keycaps are compatible with Cross‑Mount (MX‑Compatible switches) keycaps. If you remove a keycap and look at the underside, you should be able to find a letter (A,B,C,D,E,F) or Row‑Number (R1,R2,R3,R4) that identifies the profile of the keycap. Setup DIP switches according to your requirements. For Mac OSX: we recommend having DIP switch #1 in the OFF position. Setup the correct keyboard language/layout on your Operating System Keyboard Preferences (System Settings on Mac OSX) according to your requirements, e.g. English US QWERTY. The keyboard sends the correct scan codes corresponding to the printed letters equivalent to an ANSI US QWERTY layout when all DIP switches are ON. Make sure you installed the keyboard correctly as mentioned in the Installation & Quick Start Guide depending on the Operating System you are using. If after Alt-Tabbing to another application, the Alt-Tab window stays open, until Enter is pressed, or if the Shift key appears to get stuck - that is, although the key has been released the system thinks Shift is pressed (all characters are capitals), amongst others, it means that the "Sticky Keys" option is turned ON. If you do not want this behavior, please verify that the "Sticky Keys" option is turned OFF. Go to Control Panel > Ease of Access Center > Make the keyboard easier to use. Uncheck the "Turn on Sticky Keys" option. Additionally, if you press the Shift key five consecutive times, the "Sticky Keys" window shows up where you can turn ON or OFF this option. If you turn ON the Numeric Keypad (by pressing ) and the numeric keypad keys do not send the numbers or symbols that the numeric keypad should send, and instead the cursor or pointer moves around every time you press a key of the numeric keypad, it means you have the "Mouse Keys" option turned ON. Mouse Keys turns your NumPad into a mouse controller. If you do not want this behavior, please verify that the "Mouse Keys" option is turned OFF. Windows > Control Panel > Ease of Access Center > Make the keyboard easier to use > uncheck the "Turn on Mouse Keys" option. Linux > Mouse Keys is toggled using Shift + NumLock , or System > Preferences > Keyboard > Mouse Keys > uncheck "Pointer can be controlled using the keypad". upgrade the Firmware of your Truly Ergonomic Keyboard to fix this behavior. It means your Operating System does not support an Embedded Numeric Keypad. If this happens, you can upgrade the Firmware of your Truly Ergonomic Keyboard to change this behavior. If every time you turn on your computer the Numeric Keypad is ON, or when you press the NumLock key in other keyboards or keypads the Embedded Numeric Keypad of the Truly Ergonomic Keyboard turns ON, and you would prefer that neither of these happen, you can upgrade the Firmware of your Truly Ergonomic Keyboard to change this behavior. Please note that some computers have the Numeric keypad ON by default, where every time you turn on your computer, the embedded numeric keypad is turned ON. You can change the default behavior so the Numeric keypad is OFF by default when you turn on your computer. Please read the instructions of your computer on how to change this setting; this resides in the BIOS section of your computer. You can also upgrade the Firmware of your Truly Ergonomic Keyboard to change this behavior. If the problem persist, unplug your Truly Ergonomic Keyboard, save all your work and close all applications, then reboot your computer. Once the computer restarts, plug in your Truly Ergonomic Keyboard directly into a working USB port, wait until it is recognized by the Operating System. this problem is solved in most cases by upgrading the firmware to the newest version. please review the following section. 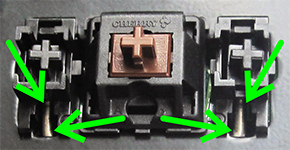 Only some older Models 207 or 209 using Cherry-Brand switches have this problem. Newer Models 227 and 229 do not have this problem. It is not uncommon that some Mechanical keyswitches require to "break-in" before working properly; this means that the switch itself requires to be pressed several times before it performs properly. We therefore ask you to un-plug your keyboard from your computer, press the misbehave key(s) several times with normal pressure for a couple of minutes, and then plug in your keyboard. This behavior usually disappears by itself after a few days of usage. If the problem persists afterwards, please read the following section. Be aware that your Operating System (OS) has an auto-repeat functionality; this means that when a key is kept pressed for a period of time, your OS repeats the key by itself until you depress the key. To change or review: Control Panel > Keyboard > Speed Tab. We have made enhancements to the Keyboard's Firmware that could fix the problem you are having. If you created a custom Layout, please upgrade your firmware to the newest custom version that solves this issue. Either use your saved custom Layout bookmark or recreate your custom Layout via the Layout Designer. Do not use compressed air that can push the debris further. The easier method is to clean it with a few drops of isopropyl alcohol; available at most supermarkets. Un-plug your keyboard from your computer. Gently remove the keycap(s) of the faulty key(s), preferably slowly with a keycap remover. With a toothpick or small screwdriver push down the inner switch; either the brown or blue plastic part compared to the outer black shell. 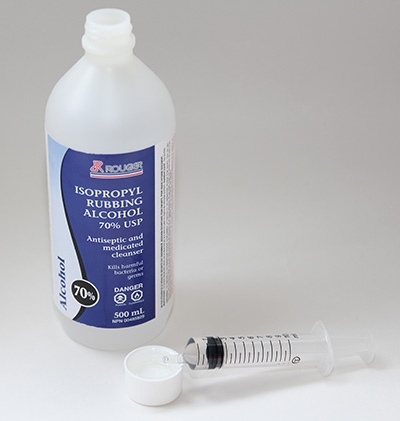 Add 4-5 drops of isopropyl alcohol; using a mouth-syringe is recommended. Press and release the switch several times. Make sure the keyboard is dry before plugging into your computer. If you are in need to do this process every two weeks or so, we suggest you read the following section. 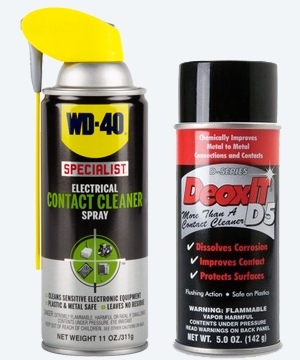 Gently spray with an Electrical Contact Cleaner like DW40 Electrical Contact Cleaner or Deoxit Contact Cleaner using their included straw. Give your keyboard a bath in isopropyl alcohol. Submerge the keyboard in a bin containing 20% isopropyl alcohol with 80% Distilled/Deionized water for a few minutes. Keeping the keyboard submerged, press faulty keys multiple times, and shake the keyboard a few times to remove debris and contaminants as much as possible. Take the keyboard out, shake it while turning right side up, left side up, and upside down. Submerge and shake inside the container, press the faulty keys multiple times, and shake outside the container, as many times as you like - the more the better. Take the keyboard out and drain as much as possible. Let the keyboard dry overnight. Make sure the keyboard is completely dry before plugging in into your computer. Wide keys like the Spacebars, Backspace, Enter, Shift, or Ctrl, use a hinge-like wire to stabilize the entire length of the key, particularly the edges, so it can properly move up and down disregarding where you press it. These hinges are called stabilizers, and like all hinges, sometimes might require lubricant to work properly. Please remove the keycap, preferably slowly with a keycap remover. Do not pull hard on the keycap, low incremental pressure is all you require. Apply a small portion of lubricant. No need to overdo; a rice grain like dab size on each spot is enough. Use only Premium Stabilizer Grease or Dielectric Silicone Grease where the arrows point on each of the sides of the keycap stabilizer. Reinstall the keycap. Gently press until is firmly attached. In some instances, adding some grease to the switch, under the keycap, solves the problem. Manually resetting the keyboard is only required if you upgraded the firmware of your keyboard and afterwards the keyboard no longer works, or either "DFU_Reset_to_ISP fail" or "DFU_Download fail" message appears every time you are trying to upgrade the firmware. Beforehand, test your keyboard with any other computer – turn on any other computer and logon if required, then properly install your keyboard as per instructions in our website. Pleaw try different computers if required. First, you need to open and partially disassemble your Truly Ergonomic Keyboard. Please be aware that if you open the keyboard, you dismiss all guarantees. We suggest you install the Dustcover. Unplug your keyboard from your computer. Set DIP switch #5 to ON “Firmware protected”. 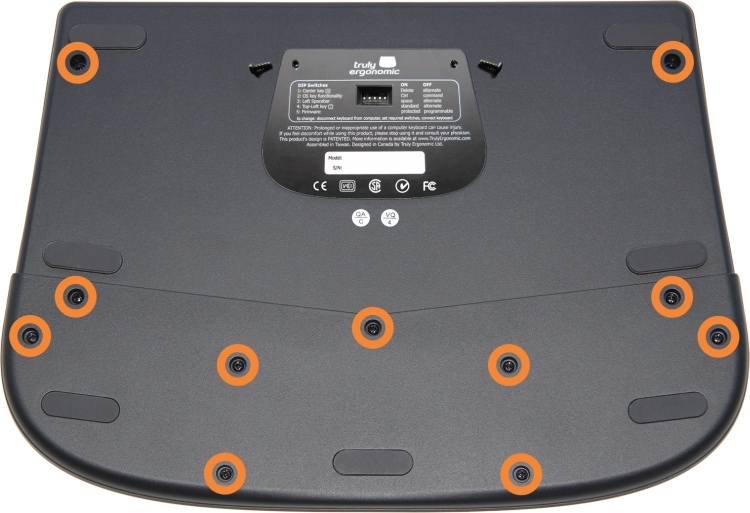 First remove the 9 screws that hold the palmrest, and then remove the palmrest. Then remove the top 2 screws and the 4 additional screws that were hidden by the palmrest. There are 2 additional screws under the back label - located on each of the top corners. Press the label on each corner with your thumbs or fingers to feel where the screw cavity is located, and then use a screwdriver or cutter to split through the label. After all the screws are out, you need to 'horizontally-twist' the top-body against the bottom-body as there are 6 'hooks' that hold these two parts together; 4 hooks on the backside where the cable is located, and 1 hook on each side. We know the design goes beyond conventional, but this, amongst others, makes the keyboard sturdier, more stable, and more comfortable to use. Make sure DIP switch #5 is set to ON “Firmware protected”. Contrary to setting DIP switch #5 OFF to allow the firmware to be reprogrammed. Plug in your keyboard to your computer. The keyboard needs power to reset itself. With a small wire or metal clip, touch pin #1 and #36 at the same time; less than a second will do. You have now performed a soft reset and the keyboard is ready for a firmware to be uploaded. Please consider this method does not work under all circumstances. otherwise it will do nothing. Having the keyboard open, if you want to clean your keyboard, do not use abrasive chemicals. You can either vacuum all parts with a portable vacuum cleaner having a soft brush, remove all debris with a soft paintbrush or toothbrush, or use a slightly isopropyl-alcohol-only dampened cloth. Make sure you unplug your keyboard beforehand, and make sure all parts are perfectly dry and free of any debris before plugging in.